Rubin & Ed is Trent Harris' off-the-wall buddy movie about two mismatched geeks on a quest to bury a frozen cat. 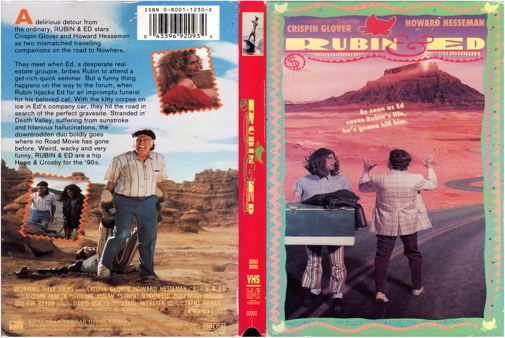 Rubin Farr (Crispin Glover) is a shy, reclusive loner who lives in his mother's hotel. He'd much rather sit in his bedroom listening to Mahler, playing with his squeaky-mouse, than go outside. His mother has other plans, however, and one afternoon she decides to pull the plug on Rubin's eccentric behavior. She demands that he go out and make at least one friend. Rubin capitulates, and after a somewhat half-hearted search, he finds Ed Tuttle (Howard Hesseman, in one of his best performances). Ed is a divorced, middle-aged loser enrolled in a self-help/ get-rich-quick organization called PPR: Positive Power through Real Estate. Ed agrees to have dinner with Rubin and his mother if Rubin agrees to attend a PPR training seminar. All goes as planned for both, until Ed opens the freezer and discovers Rubin's dead cat. The unlikely pair then embarks on an hallucinatory quest through the Utah desert in order to find the perfect spot to bury Rubin's cat. Though at first mutually disgusted by each other, Rubin and Ed eventually learn how to become friends.